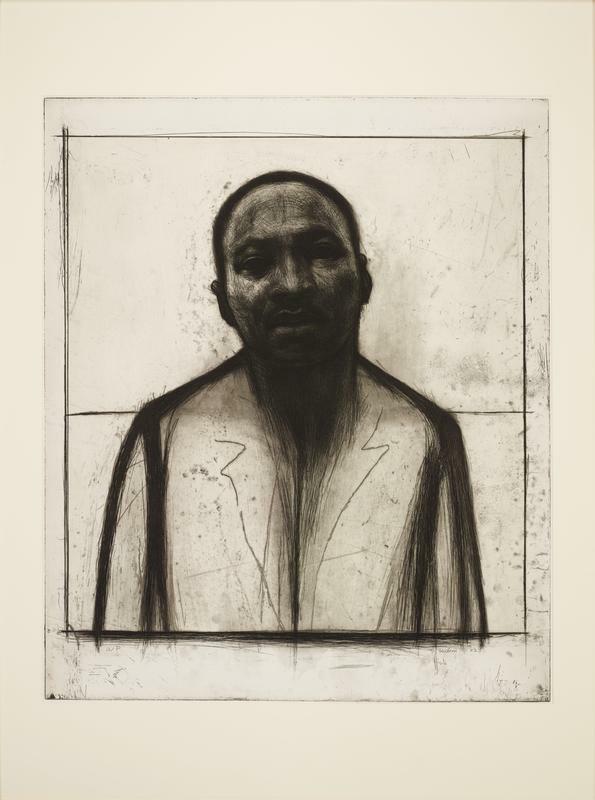 John Wilson’s portrait of Dr. Martin Luther King, Jr. is based on his 1986 memorial statue of the civil rights leader housed in the United States Capitol Rotunda in Washington, D.C. As in the sculpture, Wilson captures King’s physical attributes and inner spirit in equal measure, presenting a countenance of solemn contemplation while suggesting a certain vulnerability. Rendered nearly life-size, King appears almost weary, as if struggling with the psychological and spiritual burdens of his prominent role in the fight for equal rights. At the same time, the portrait’s scale and formal structure lend the work an underlying sense of strength and solidity. Wilson also alludes to King’s death as a sacrifice. Though not overt, the crossing of the horizon line and the vertical line formed by King’s suit jacket signifies the wooden cross of Christ’s crucifixion. Like Jesus, King gave his life for a higher moral cause. Together, these salient features present King, who was one of the most esteemed public figures of the twentieth century, as both a man and a national hero. John Wilson; Printer: Center Street Studio, Milton Village, Mass. ; Publisher: Center Street Studio, Milton Village, Mass.